By happy coincidence, major donations of Japanese prints to the Allen Memorial Art Museum have roughly paralleled major movements in Japanese printmaking from the 18th through the 20th centuries. This exhibition presents works by master printmakers from a variety of periods—a dual chronicle of this printmaking history and the growth of the museum’s collection. In 1950, the Allen received from Mary A. Ainsworth (Class of 1889) some 1,500 prints of the Edo period (1603–1868) that depict the “floating world” of 18th- and 19th-century pleasure districts. 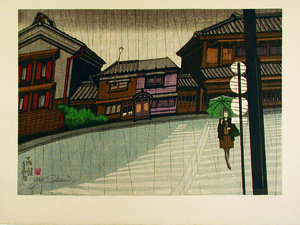 In the 1980s, Paul F. Walter ’57 began donating limited-edition surimono prints of the Edo period, as well as late-19th-century prints from the Meiji period (1868–1912). In 1997, the AMAM received 20th-century landscape prints in the shin-hanga (new prints) style from Owen T. Jones ’29 and his wife, Margaret. Later that year, Sarah G. Epstein ’48 added other shin-hanga prints, as well works from the sōsaku-hanga (creative prints) movement in which individual artists did all of the woodblock carving and printing themselves. The most recent major gift came in 1999, when Dr. Sanford Palay ’40 donated prints made from the 1960s to the 90s, including etchings and lithographs. Due to the generosity of these and other donors, this exhibition offers a look at Japanese society from the time of its isolation in the 18th century up until the late 20th century. Organized by Joan L. Danforth Curator of Asian Art Kevin R. E. Greenwood, with Elka Lee-Shapiro (OC ’18), curatorial assistant in Asian art.